If I didn’t know better, I’d swear someone is living behind our local dumpster. More likely, it just means the college students are moving out over the summer. At night, I like to imagine that the raccoons are hosting tea parties back there. Other people’s mail. Other people’s lives. Aww, I remember living in a college town! 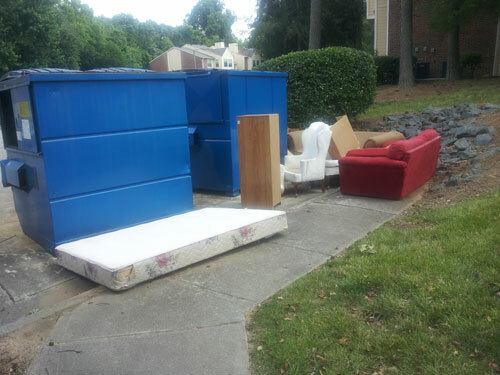 The BEST dumpster diving (okay, my ONLY dumpster diving) was when they would move out and get rid of perfectly good furniture or unopened packs of school supplies. Who can afford that?! I still have a great coffee table I rescued from my neighbor’s curb in 2006. When I first moved here, some college kids abandoned an IKEA bookcase next to the bottom of the stairwell. They didn’t even both to drag it the extra 300 feet to the dumpster! I snatched it up after a few days. What a shame they didn’t call one of the agencies who aid the homeless/poor to come pick it all up.